On the third Sunday of the month, worship is held in Insh Village Church at 6pm. Usually the service follows a liturgy similar to those used in Iona Abbey. The service is quiet and reflective. The church building is always open, and it is being developed as a place of prayer and pilgrimage. 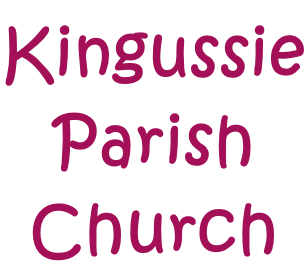 Leaflets are available in the church which outline a pilgrimage between Kingussie Parish Church and Insh Village Church, and a Christian Aid pilgrimage round a local Sculpture Park. 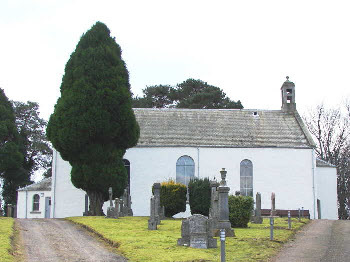 In the mid 19th century during the Disruption in the Church of Scotland, some of the congregation left the Parish church of Insh Parish Church, Kincraig, to hold their own services in Insh village. At first they worshipped in the open air. A Reader called Donald Cattanach walked every Sunday from Glen Banchor in Newtonmore to lead their worship in Insh Village. A local woman wove a plaid to protect the Reader and his bible from the weather and this plaid is kept in Kingussie Folk Museum. Eventually the land owner built them a small Church with a tin roof – known locally as the “Mission Church”. 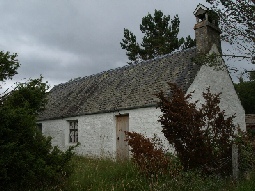 The tin roof has been replaced with tiles, a ship’s bell has been installed in the roof, a mosaic window made by school children is in the wall facing the road, and the village war memorial was placed within the Church grounds. 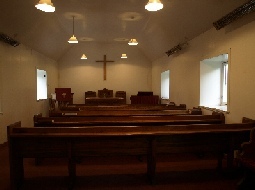 A service is held in Insh Village Church at 6pm on the third Sunday of the month. Local weddings, baptisms and funerals have taken place there too. 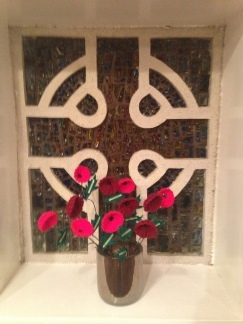 The poppies in the foreground were knitted by Shirley Nield. Each one has a name from the Insh war memorial and was created in their memory .